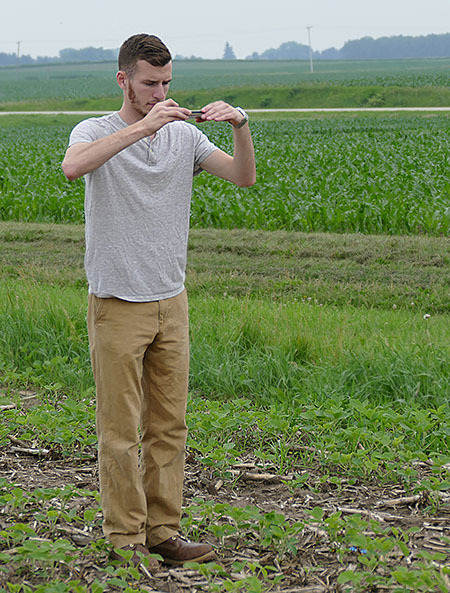 The Wisconsin Soybean Replant Calculator will calculate plant stand (population) by averaging five plant count samples randomly taken within a soybean field at the VC, V1 or V2 growth stage. The app will use that estimated stand count to calculate expected yield percent at harvest with and without spring replanting. You can then use the calculated values and the economics of your own farming operation to determine if spring replanting is a viable option. For all locations inside Wisconsin, historical median frost date for the closest township is given to help with your decision. How to hold the camera for the Bean Cam app. To begin, enter a name for a new replant calculation record. Then you select the soybean growth stage and the row spacing for the field. GPS field location will automatically be saved for your report. Camera count method is available if a row spacing of 7.5, 15, or 30 inches is selected. After the first picture is taken and plant count is displayed, you then count the number of plants on the ground in the first picture area. A picture covers an area on the ground that is 5’ wide by 4’ in row length. Yellow lines on the camera screen will show you where to line up the rows of soybeans in the picture. A special high contrast filter can be toggled off and on to help you see the rows on your camera screen. 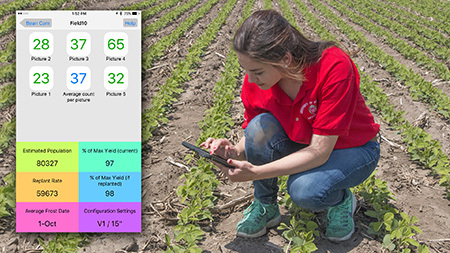 You compare your actual count on the ground with the number the camera first calculates, and then move the calibration slider until the first picture’s plant count matches your ground count. The camera is now calibrated so you will not need to count the plants on the ground for the other four pictures. After five pictures, the average sample count is used to determine the estimated stand count for the field. If Manual count is selected, count two rows side by side and enter that number in one of the five sample boxes. Length of row to count is given and is based upon row spacing. After five counts are entered, the average will be used to determine the field average population. For either method, you can choose to email a report with the replant information that was calculated. The results are also saved to a list of records that you can view at a later time. 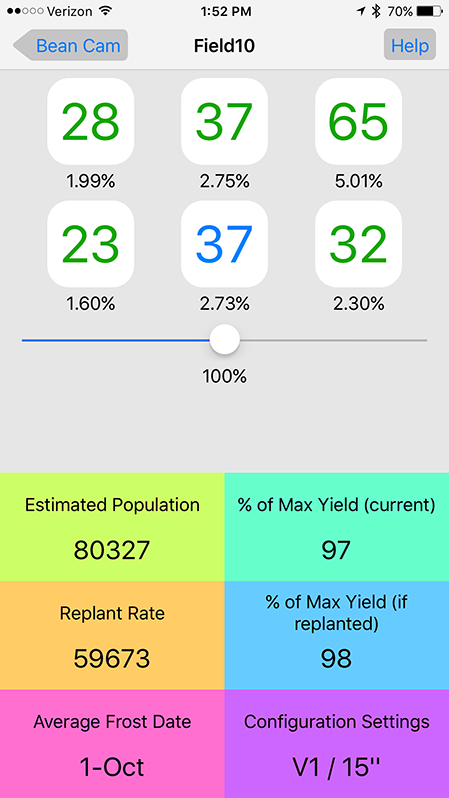 When you have finished with a field calculation, you may go back to the home screen and start a new replant calculation record for a new field. Using Bean Cam app to determine soybean replanting calculations. -Information calculated is based upon accuracy of grower inputs, and UW filed research. -Notify crop your crop insurance agent before replanting for potential replant payments. –Review any herbicide restriction before replanting and consider fuel, labor, machinery, and seed supply needs. -If hail damage is the cause for reduced plant stand please use manual plant count method view this extension pub for more information. –MG based upon date. Before June 1st use full season. After June 1st use 0.5 MG lower. After June 10th use 1.0 MG lower.